03/10/2009 Wow 7 months since my last update! I haven't been idle however. 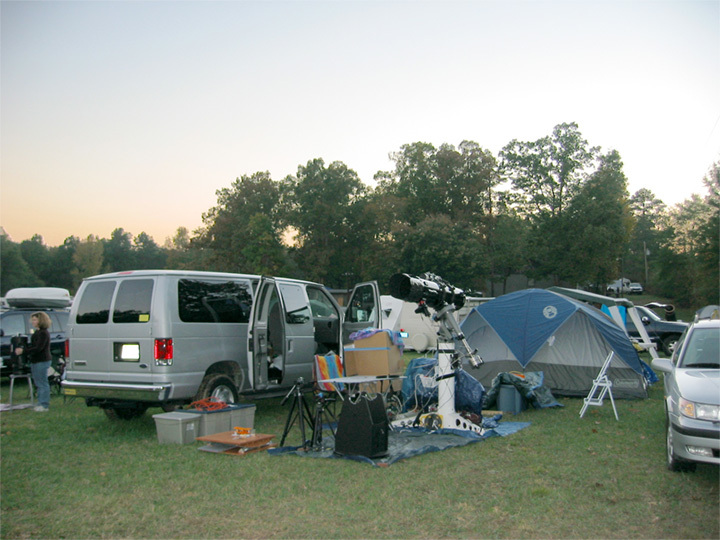 I went to two star parties (MASP in NC and WSP in the Florida Keys). Here are some pictures from MASP and WSP. Also be sure to check out all the NEW images I've been working on. I've been imaging mostly with my Canon 200mm f/2.8 lens and a GSO 200mm f/4 Newtonian. The Takahashi NJP mount has been a very good performer. I was able to goto Doughton Park in the NC mountains last weekend and meet up with some fellow NC imagers. We had a great first night and I have a good quantity of data to process. Its been a wet Spring and Summer so I haven't had much time to image. I did recently aquire a one shot camera called a SXV-H9C. Its similar to my SXV-H9 but it uses a RGB Bayer pattern of the same chip so you can shoot color images with it instead of making color images from separate RGB images. My first image is of M20, taken with my Epsilon 180ED. 03/10/2008 I recently added a Takahashi NJP to the collection of mounts and I've started taking galaxy images with the DBA 10 inch Newtonian. Here is one of M104. 01/28/2008 I started to play with a SkyWatcher 200mm Newtonian I picked up for cheap on Astromart. Here is a shot of the Moon and M42. So far I'm pleased, especially for the money (less than a nice Pentax eyepiece!). 12/24/2007 Happy Holidays! I've added several new images of Mars and Comet Holmes. Be sure to check out my animation of Mars and an image of a conjunction of the Moon and Mars. 12/2/2007 Despite some clouds I was able to shoot my first grazing encounter of the Moon and a star. Here is a link to the video. 11/15/2007 Added another image of 17P/Holmes I was able to take last night during a break in clouds. I also created an animation showing how the comet has grown in the past week. 11/14/2007 I have written up a overview of the setup I use to image with a Canon SLR lens. 11/14/2007 Just joined the Raleigh Astronomy Club. This is a growing group of entusiasts in the area. Looking forwards to some imaging from several of the dark sites they frequent. 11/10/2007 I have written up a howto for converting a finder scope to a guide scope. 11/08/2007 I added a new image (or an alternate version) of 17P/Holmes I took with a Canon 200mm f/2.8 lens. 11/02/2007 Uploaded a new image of 17P/Holmes I took Halloween night. Using wavelets I find the same sort of core structure as other observers have reported. 10/30/2007 I took a deep image of the comet 17P/Holmes and I think I resolved some tail-like structures. 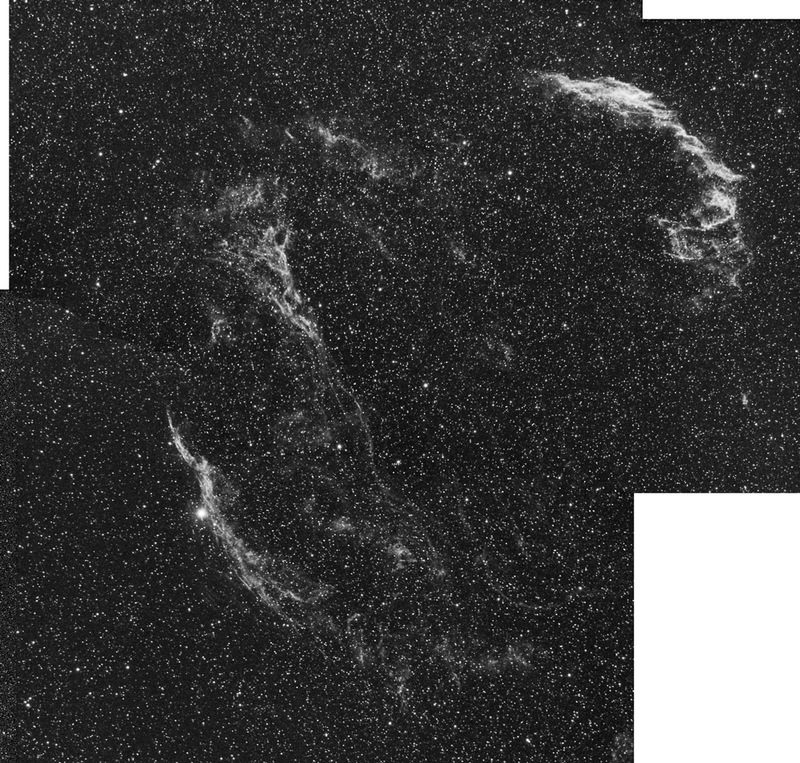 Its been a fun project to image this comet as I've never tried to image a comet before. 10/29/2007 I took a quick image of 17P/Holmes last night. 10/21/2007 I've been busy imaging at a dark spot in NC called Doughton Park in the mountains. I've collected enough data to keep me busy processing for several weeks. Hopefully I can start getting some images up on the website soon. 08/04/2007 I wrote a quick summary of my experiences imaging the same objects with my GSO 200mm f/4 Newtonian and TEC 140 APO refractor. I love both scopes and I was pleased with how both performed. 08/04/2007 I made a quick first pass at my first deep sky mosaic: NGC 6992. This is a set of 3 frames taken with a Canon 200mm f/2.8L lens using an Astronomik 13nm H-alpha filter. Each frame is approximately 2 hours of data. 08/02/2007 I had a chance to try out the Canon 200mm f/2.8L lens with my SXV-H9. I am very happy with the results: M13 and M8. Conditions were hazy with a bright Moon. I was mostly interested in seeing how well the stars in the corners looked with the lens wide open. 07/18/2007 My review of the GSO 200mm f/4 Newtonian appeared on Cloudy Nights. 07/17/2007 Despite the clouds I took two test shots (Vega and Altair) with a Canon 50mm f/1.8 lens on my modified Canon Rebel Xt. I stopped down the lens to f/3.5. I removed the clouds as much as possible. I mainly wanted to see how the stars looked in the corner. Focus is very sensitive - if you are off you get bad coma in the corners. Overall looks like a good lens for wide shots. 07/11/2007 I added an article about noise reduction using Pixinsight. 06/30/2007 I added several images to the Image Gallery, as well as a page comparing images of the globular cluster M3 imaged by two different Newtonians. 06/27/2007 I've put a writeup about the GSO 200mm f/4. 06/26/2007 I've spent June working with my GSO 200mm f/4 Newtonian. Its worked great with a Baader MPCC to reduce coma, and I even took some shots with a 1.5x Barlow to extend its focal length. So far its shaping up to be a nice imaging scope! Here are some sample images: M3 M8 M16 M11. 06/03/2007 After 4 years I decided to redesign my website using CSS instead of a hammer, chisel, and stone! It will be a work in progress as I decide on colors and layout. Please email me any glitches you may see. 08/10/2008 I was able to goto Doughton Park in the NC mountains last weekend and meet up with some fellow NC imagers. We had a great first night and I have a good quantity of data to process. 07/10/2008 Its been a wet Spring and Summer so I haven't had much time to image. I did recently aquire a one shot camera called a SXV-H9C. Its similar to my SXV-H9 but it uses a RGB Bayer pattern of the same chip so you can shoot color images with it instead of making color images from separate RGB images. 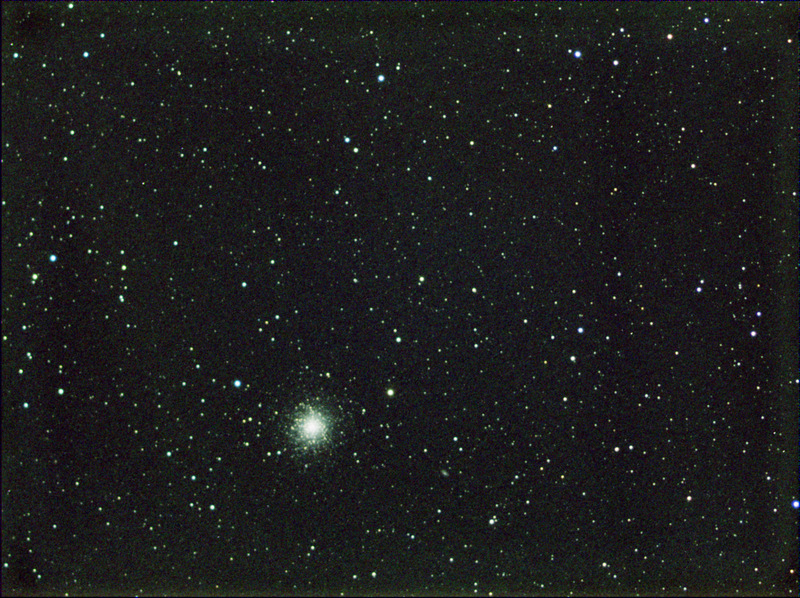 My first image is of M20, taken with my Epsilon 180ED. 08/02/2007 I had a chance to try out the Canon 200mm f/2.8L lens with my SXV-H9. I am very happy with the results: M13 and M8. Conditions were hazy with a bright Moon. I was mostly interested in seeing how well the stars in the corners looked with the lens wide open. There seemed to be a slight tilt which might be the custom lens adapter I'm using. Overall a great first light! 07/11/2007 I added an article about noise reduction using Pixinsight. 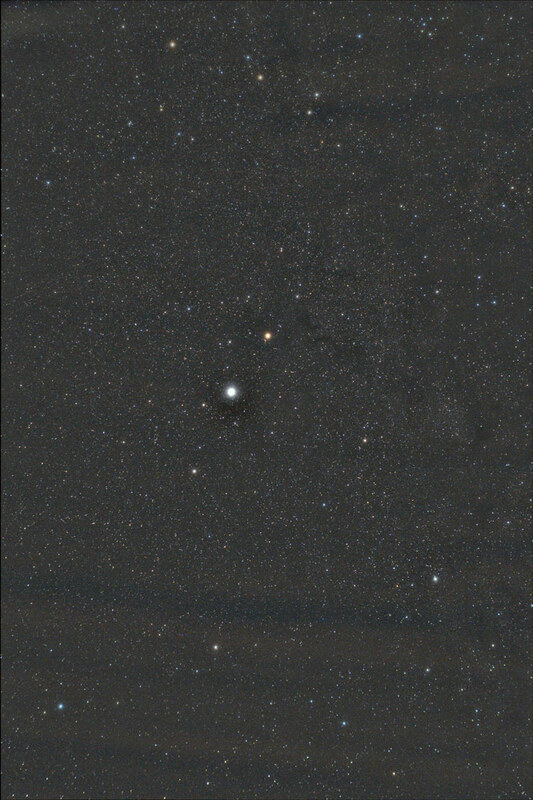 06/30/2007 I added several images to the Image Gallery, as well as a page comparing images of the globular cluster M3 imaged by two different Newtonians. 06/03/2007 After 4 years I decided to redesign my website using CSS instead of a hammer, chisel, and stone! It will be a work in progress as I decide on colors and layout. Please email me any glitches you may see. 06/03/2007 I rigged together an adapter from the Moonlite focuser to my Robofocus stepper motor for less than $10. 05/31/2007 Played with the 200mm f/4 some more and DDP/LUCY processing - results here. 05/27/2007 I've been tinkering with a GSO 200mm f/4 Newtonian for imaging. Its a nice fast scope and has a reasonable focal length. Here is my first light. This scope costs less than some eyepieces and does a great job! 05/10/2007 Thanks to some helpful comments from other imagers I've updated my Leo Trio image. 05/03/2007 Added NGC 2903 and Leo Trio images to the Image Gallery. I now have hit a milestone - 100 image entries in the gallery! 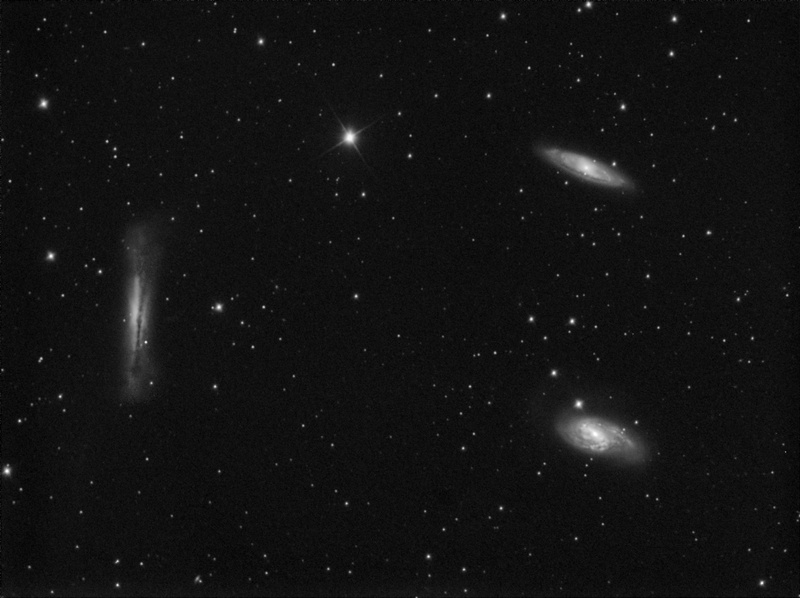 04/14/2007 - Had some time to try out my new Tak Epsilon 180ED and took some quick unfiltered data of the Leo Triplet before I shutdown due to clouds. I could tell it needs some collimation but I was happy my Atlas mount handled it superbly. 03/23/2007 - Uploaded an image of M51 I took last week under some better than average conditions in my area. I've also started playing with a transmission grating I bought a few years ago to take spectra. 03/05/2007 - More testing of the Atlas mount and I'm liking it. I imaged at a higher focal length with my C8 and it did well. The Moon was bright so this was more a testing of tracking than anything else: M82 test. 02/23/2007 - A mix of bad weather and a sudden surge of interest in robotics has had me not out too much. However after reading about the Atlas EQ-G mount and the EQMOD software I got my motivation back! 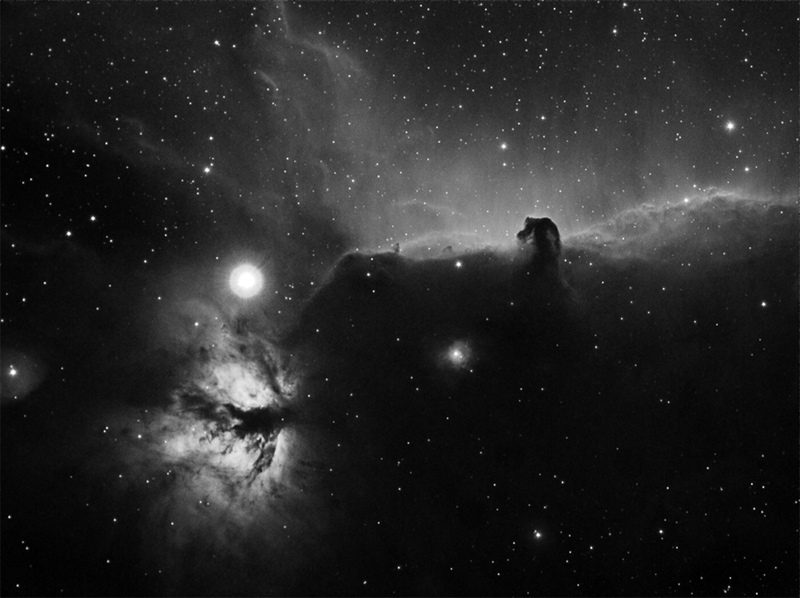 I'm quite pleased with it so far and even got a decent shot first night out of the Horsehead nebula. A later attempt with 10 minute subexposures is here. 01/29/2006 - I'm published! My Bubble Nebula image is in the March 2006 Sky & Telescope. 01/26/2006 - My camera has been out for service so I've not been imaging lately. I've been helping a friend with a new observatory and thinking I need one of those in my backyard!. 12/16/2006 - I've been trying out a Rebel Xt (unmodified) while my SXV-H9 is being serviced. Its an interesting camera and I think I'll get a modified one soon. Here are two images I've taken with it so far: M33 and Double Cluster. 11/15/2006 - Uploaded an image I've been struggling with for about 3 days now. Its a star forming region in M31 called NGC 206. I've always struggled getting colors correct for M31 and this time was no exception. The data was taken in October at the MASP star party. Here is a link to the image. I also put up a couple of photos from MASP 2006: Photo 1 Photo 2. I slept in the big grey van and used every cubic foot of it taking just about every piece of equipment I owned with me! 11/07/2006 - Today I made the trip to Raleigh, NC to see the new showroom of Big Bang Astronomy. I'm really excited having an astronomy store within driving distance! 10/24/2006 - Just got back from almost a week at the Mid-Atlantic Star Party. We had 2 great nights and a couple nights of rain. I managed to win several awards in the imaging contest which I'm real happy about. The food was great and I met alot of entusiastic amateur astronomers. There were even a few fellow imagers there, but the vast majority were using big SCTs and Dobs for visual work. I had some fun with my binoculars while waiting on data. 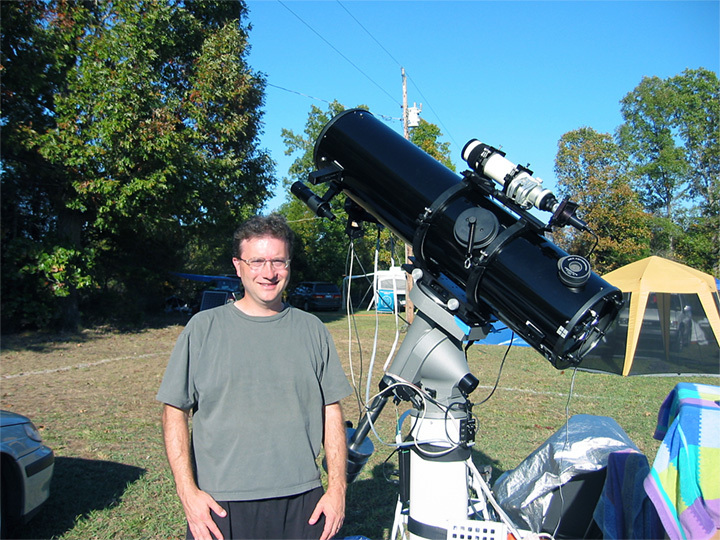 08/16/2006 - I had a clear night to try out the DBA 10 inch Newtonian with the new stepper motor focuser. Works like a charm compared to the old focuser. I had enough time to get an image of M57. 08/14/2006 - Just got back from the ECCAI meeting in Philadelphia and met with a large group of fellow astroimagers. I attended a day and a half of talks and came back with alot of ideas on how to improve my images. Plus I met a fellow who lives near me who is also into imaging! What are the odds? 07/21/2006 - I have been imaging with a 135mm SLR lens recently and experimenting with drizzle. My first color image is of M11. 06/24/2006 - Had a quick outing with the Newtonian again and got about 15 minutes of L data for M4 - the result is here. 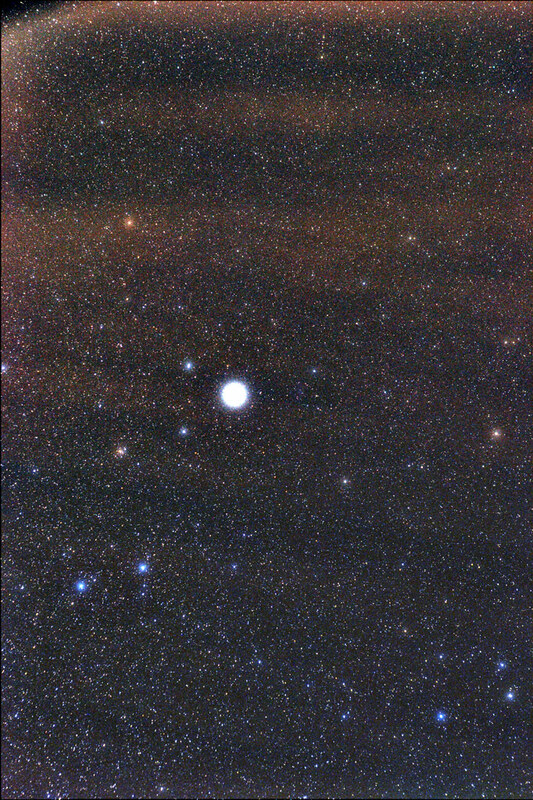 I'm pretty pleased for a first shot - the corrector seems to be at about the right spacing for my CCD as seen by the reasonalby round stars (I wasn't guiding and didn't have time to fine tune the polar alignment). 06/23/2006 - Just had a first light last night with my new DBA Astronomy Certified 10 inch Newtonian, which I hope will be an excellent imaging platform. 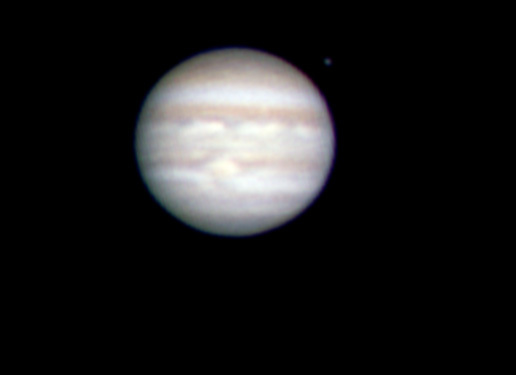 My equatorial mount is temporarily out of commission so I took very quick shots of Jupiter with my webcam. Basically I'd put Jupiter on one side of the webcam image and watch it shoot across, then I'd reset the scope back on Jupiter and do it again. Actually worked better than I thought - here is the image. 06/08/2006 - Finished work on a mosaic in the Tycho/Clavius region which I'm really pleased with how it turned out. I was able to enhance the image using some new techniques which I think give an equivalent result as using wavelets but without creating as many noise artefacts as I get with wavelets. 06/08/2006 - I was reducing some AVIs from a lunar imaging run and saw this odd atmospheric effect - I'm guessing it was a different temperature air mass moving in? Email me if you have any ideas. 06/05/2006 - Redid the image gallery and added categories for the different images. Should make it much more enjoyable to browse. 06/02/2006 - Added an image of M63 I collected in late May and just finished processing. 04/21/2006 - Just uploaded a color image of M81 I'd taken with my TEC refractor in March 2006. 04/20/2006 - I just uploaded images of the Moon, Jupiter, and Saturn here taken with my C8 which I've been re-collimating with an artifical star I built recently. 04/17/2006 - Here is a quick image of M5 I took with my C8 at prime focus. 04/12/2006 - I've been busy working on some images but haven't finished the processing to the point I'm happy with how they look. I spent alot of time collimating my C8 and getting the autoguiding on my MI-250 working with this scope so I can start focusing on galaxies the next couple of months. 11/12/2005 - First images I processed from MASP are up and they are M31 and NGC 7000. 11/9/2005 - Just got back from MASP, a star party just down the road from here. I had a great time imaging in much better conditions than I've ever before, and met some great fellow astronomers. I had a blast with Mark Lerch and his new Meade DSI. And to top it off I won Best Image at their contest! I'm going to rest then put up the images I took there. 10/25/2005 - Got the H-alpha filter in the mail and here is my first attempt with the 135mm lens I got last week. 10/20/2005 - I wrote up my successful tests with a Soligor 135mm T Mount lens. I now have a cheap way to get almost 4 by 3 degrees FOV with my SXV-H9. 10/8/2005 - Finished processing on data for the galaxy NGC 891. I had some difficulty getting the background flattened properly and this hurt how far I could push the image but its one of the better galaxy images I've done. 09/24/2005 - I reprocessed my 11/29/2003 observation of M42 - check is out here. 09/20/2005 - I experimented with my SXV-H9 and lunar imaging and had some encouraging results. Check out the new images in my gallery. 09/07/2005 - I added images of NGC 7023 (Iris Nebula) and IC 5146 (Cocoon Nebula) to the image gallery. 08/23/2005 - Apparently I was one of many people to image a previously unknown variable star in M27 this month. See this link for a good summary of whats known. I have images from 8-12-2005 that do NOT show the object, and from 8-16-2005 that do show it. For now one I'm going to blink between frames when I combine multiple nights of data! This link shows the location of the nova in the observation I made. 08/22/2005 - I was able to image some during hazy conditions on the night of the 20th and I've put up new hires M13 and M15 images taken with C8 that night. 08/20/2005 - Finally processed my M13 data from earlier this month and put the result in the gallery. 08/18/2005 - Added some H-alpha and more L to my M27 a few nights ago. Reprocessed and put new image in gallery. 08/12/2005 - Tried using my Celestron C8 SCT at f10 for the first time on the Dumbell Nebula (also known as M27). I was pleased how well I could guide at this focal length (2000mm). I'd never guided above 1000mm before and wasn't sure what to expect. Main problem is that I found that imaging at f10 made all the dust on my CCD window obvious as dust donuts. They mostly went away when I flat fielded but I think its time to open the CCD camera and clean it out! 08/04/2005 - Finally had a night with clear skies and nothing on my schedule. After some time refamiliarizing myself with the process it was alot of fun to be collecting photons again. I was able to image the Pelican Nebula in H-Alpha and the globular cluster M13 in color. The Pelican Nebula image is now in the gallery. 07/22/2005 - Looks like Dave isn't done nagging me to update my website just like he did at RHAD Labs . I'd love to have something to update but the weather and my schedule haven't allowed me to image lately. I've mostly been building and flying RC planes in my spare time. 01/05/2005 - I finally was able to try my TEC 140 APO for imaging with the AP 0.75x reducer I have. I've seen this combo used by several imagers before. You get around 750mm focal length and its reasonably fast at around f/5.1. 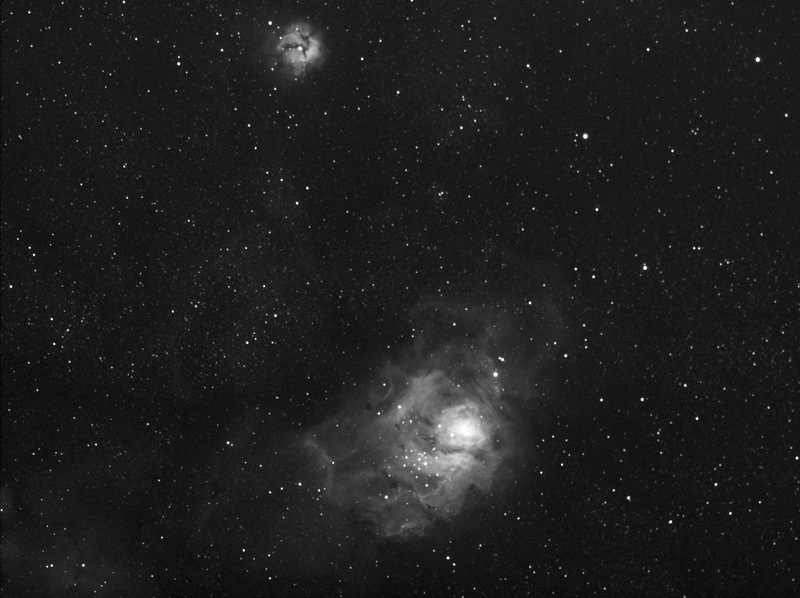 See the IC 410 image in my image gallery for my results. 11/19/2004 - Its been much cooler and conditions have been more favorable. I was able to image M52 and M33 in the recent few weeks. Check them out in the gallery. I plan on trying a mosaic of the Cone nebula next time I can go out. 09/27/2004 - Went out with the TEC APO 140 and my DMK 21F04 camera to image the Moon - here are the images. I like the high framerate of this camera, but I'm challenged by its 8 bit dynamic range. I tend to overexpose parts of the image to get enough signal in the dimmer areas. I think next time I'll try taking long and shorter exposures and combining. 08/06/2004 - We've had a cloudy humid summer so far here in North Carolina. I haven't had a good opportunity to get out for several months! I'm hopeful this weekend will work. I'm really wanting to do some widefield work in the Milky Way direction. 05/16/2004 - Had another night with the DMK 21F04 camera doing some lunar imaging. Conditions were very poor but I was able to salvage some frames given the high frame rate of this camera. Check out the images. 05/14/2004 - I modified my gallery layout slightly to handle these nights where I generate alot of images of the moon. 05/05/2004 - I had a chance last week to try out the Imaging Source DMK 21F04 B&W camera that I have on loan. It is firewire and allows 30fps uncompressed, so I am using it on the moon for some high resolution work. Unfortunately the seeing did not cooperate fully. It gave me some of the best images I've taken yet. I'll need some better seeing in order to judge if its worth the extra money over the Toucam. Its a nice camera either way! Here are the lunar and Jupiter images. 03/29/2004 - I think I've been slowly getting burned out on the whole routine of dragging all the stuff to do long exposure, color CCD work outside each night, and dragging it back in the next morning. So I got a webcam and a Sky 90 on a alt-az mount and just played around with some lunar imaging. It was energizing to do something so simple and yet rewarding! 02/29/2004 - Long ago I was a graduate student in astronomy. I received my PHD in 1995 - the topic was the tidal disruption of stars by supermassive black holes. You can see my work here. Why is this interesting - read this exciting discovery. 02/28/2004 - Been playing with my new TEC APO 140 some. I've taken some test photos but the weather hasn't been kind so far. Decided to try some planetary imaging with it and was really surprised how good it looked considering the small aperture of this scope. 12/12/2003 - Several of us in the Yahoo Group 'CCDCollab' are working on the supernova remnant IC 443. We're all working with H Alpha filters and stacking all our data. You can see our progress here.